What are the steps I can take to reduce the likelihood of getting sued over the accessibility of my Information and Communication Technology (ICT)? Decide you want to make your ICT accessible. Publicly announce your accomplishments and continued commitment. Doing #1 immediately reduces the likelihood. Not doing #2 significantly increases the likelihood. Omitting #1 and #2, and only doing #3 is a recipe for getting sued. In-Depth Answer: What are the steps I can take to reduce the likelihood of getting sued over the accessibility of my ICT? There have been a number of lawsuits against and a number of structured settlements with businesses that have demonstrated unwillingness to tackle the accessibility of their Information and Communication Technology (ICT). You may yourself have some apprehension if you consider that you might be vulnerable to a lawsuit. If you have ICT that has known accessibility problems, or if you have never thought of accessibility issues before, know that there are solutions that are readily available. This is why we created the Accessibility Switchboard project, to provide short introductory articles on topics relevant to industry, and links to further in-depth resources for the specialists working for and with you. These articles cover what is needed to work towards having a successful approach to ICT accessibility in your organization. Sure, there will be work to be done, because magic wands are in short supply. However, the amount of effort and investment of time and resources is probably way less than you anticipate. Ready to roll up your sleeves? Where do I get good / accurate information on ICT (web, software, mobile, electronic document) accessibility? I’ve been told to make sure the things I procure are accessible. How do I do this? What if you do only parts of these suggestions? We link (above) to a guide on how you can make a successful pitch to executives to gain their commitment to work on accessibility in your organization. Executives are the only ones who can make this kind of commitment, so if you don’t have that, you are increasing the likelihood of being sued. People with disabilities are really looking for equitable access to ICT, using solutions that are readily available. We also wrote guides for people with disabilities on how to articulate their needs to companies, and how to approach change makers. In the guidance, we suggest that legal action should be the very last resort. Without obtaining an organization-wide commitment to accessibility from the highest levels, the first resort suggestion given in the guidance (consumers should contact customer support) will be a frustrating experience at best, or an exercise in futility at worst. You can only sue someone who is suspected of breaking the law. The laws are there for a reason. The laws only require companies to do what is technically and practically possible. Other companies have made achievements in ICT accessibility that can be cited as benchmarks. Lady Justice is typically depicted with a blindfold, and we instinctively know that justice should be ‘blind’. This is ‘blind’ in terms of fairness. Up to 20% of the population has some kind of disability, and the legal system has been set up to provide a measure of fairness to all people in society. A commitment to providing accessible ICT can also be supported by committing to making an accessible work environment, hiring and promoting people with disabilities, and being proactive in terms of employee engagement with accessibility issues. Whether loud marketing proclamations or subtle footnote statements on your web page, the proof is in the pudding. If you market your products based on quality, and you don’t have a quality assurance process, you’re likely to lose customers. If you’re a big multinational company and you have a statement that says you respect diversity, but you have a boardroom comprising only white, able-bodied, straight men, how will people believe that you actually ‘respect diversity’? Publicly announcing you are accessible, without making a genuine effort to make your ICT accessible, and without obtaining executive support for your accessibility program efforts, is a pudding that people with disabilities are going to find unappetizing to say the least. You could do #1, #2, and #3, and still get sued. However much you try to reduce any given risk you cannot eliminate it completely. But, if you’ve lowered your risk by being proactive on accessibility efforts then you’ll be in a much better negotiating position if you do happen to get sued. The Guides and Q&A articles areas have the articles referred to above in single lists. 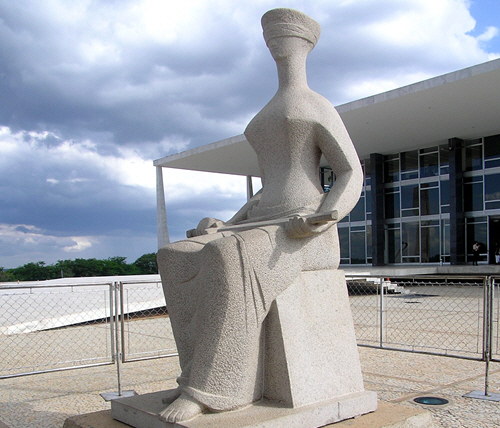 ‘The Justice, in front of the Supreme Court of Brazil’. by Morio. CC BY-SA 3.0. Cropped from original.